Will your neighborhood be next? One career ago, I was a professor of film studies. I gave that up to move to Vermont and write for Seven Days, but movies will always be my first love. In this feature, published occasionally here on Live Culture, I'll write about the films I'm currently watching, and connect them to film history and art. I have found some unusual DVDs in random places: garage sales, thrift stores (who gives up a copy of The Way Things Go? ), even at a rural Wisconsin truck stop (where, amidst the Chuck Norris DVDs on the discount rack, there nestled a highly improbable copy of A Couch in New York, one of the few quasi-mainstream films by Belgian experimentalist Chantal Akerman). I’m always delighted to find a copy of a film in a location that seems completely unrelated to it. When I found a copy of Penelope Spheeris’ Suburbia at a stoop sale in Brooklyn about a year ago, I snapped it up for a buck or two. This was a less arbitrary discovery than the Akerman in the truck stop, but it wasn’t bad. It’s not like Suburbia or its director are obscure, but the film isn’t discussed much anymoree. And its story is so thoroughly steeped in early-’80s L.A. suburban subcultures that stumbling across it in an East Coast city added somewhat to the improbability of the find. Suburbia is Spheeris’ first fiction film*; her first feature-length film is the well-regarded and revelatory 1981 documentary The Decline of Western Civilization. Both films are about disaffected punk-rock youths in and around L.A., and it seems correct to regard them as “sister” films. Spheeris was fascinated by punk rock, its fans and its culture, and clearly hadn’t gotten these subjects “out of her system” with The Decline of Western Civilization. (Indeed, she has returned to that subject twice in her career, making The Decline of Western Civilization Part II: The Metal Years in 1988 and The Decline of Western Civilization Part III [about L.A. “gutter punks”] in 1998.) Perhaps part of Spheeris’ motivation for making Suburbia was to work through some of her “leftover” ideas about punk culture. The Decline of Western Civilization is mostly a concert film, featuring some great live footage of such L.A. punk bands as Germs, Black Flag, Fear and X, one of my favorite bands ever. Suburbia also devotes significant time to concert footage of several bands: D.I., the Vandals and T.S.O.L., who give what is by far the film’s most compelling performances. I don’t know this band very well, but Suburbia made me want to dig into their catalog. Spheeris is probably best known for directing Wayne’s World, which I’ve never much cared for, mostly because I don’t find it funny at all. And many of her other films are fairly undistinguished comedies such as Black Sheep, The Little Rascals and The Beverly Hillbillies — none of which is especially interesting to me, despite the presence of Lily Tomlin and Dolly Parton in the last. Suburbia is not great, either, but Spheeris’ love for her material is evident, and it makes the film fascinating despite its shortcomings. In true Rebel Without a Cause fashion, Suburbia’s central argument is that the “families” founded by wastrel punk-rock youths are more loving and authentic than the kids’ actual families, never mind the ripped pants and the absence of hygiene. 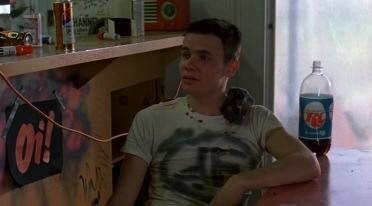 Yep, that's Flea of the Red Hot Chili Peppers, credited in this film as "Mike B. The Flea"
I’m partial to films in which not a lot happens, and Suburbia is admirably plotless. That befits the lives of its main characters, who don’t do much of anything. They go to rock shows, steal frozen dinners from garage refrigerators and just kind of, like, hang out and stuff. Exactly the kinds of things that, in the film, enrage the “upstanding citizens” of the suburban town where the kids make their home in an abandoned ranch house. 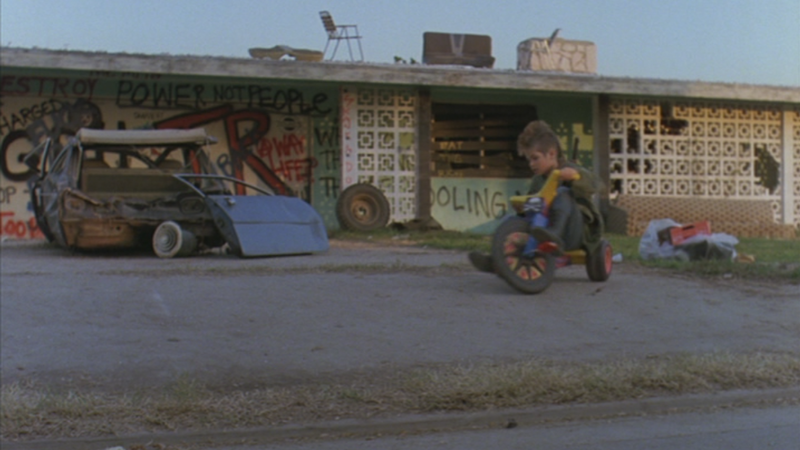 The tension between the kids and said citizens hangs in the background for the film’s first two thirds, but doesn’t really lead to much action. Then one of the kids, a new addition named Sheila, kills herself by overdosing on pills. Not knowing what else to do, her friends decide to bring her body to her family’s home. It’s a difficult decision, not only because they loved Sheila but because she had revealed to them that her father had sexually and physically abused her. The delivery of Sheila’s body to her family’s home is the turning point of the film, in that it precipitates just about all of the action that follows. 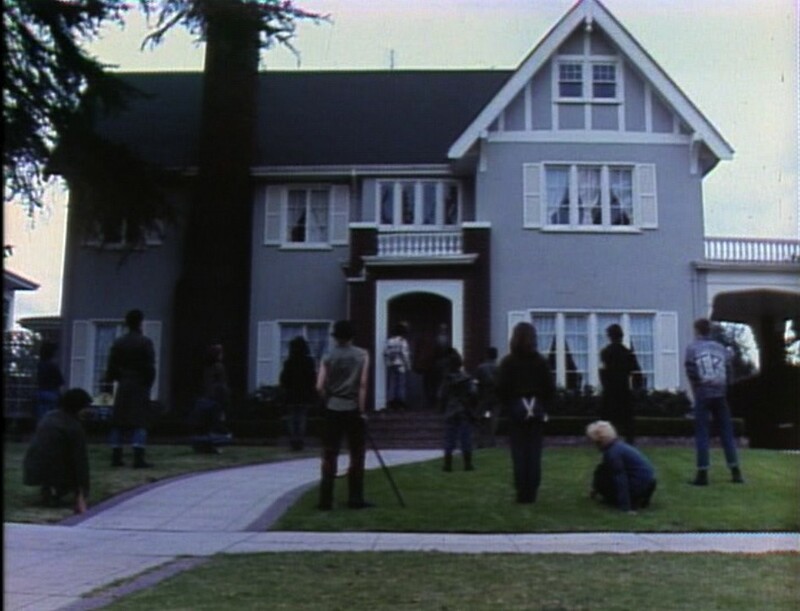 As befits the film's most important moment, Spheeris depicts it with the best and most memorable shot (below): the punks standing on the lawn of this suburban house. It’s a sophisticated visual gesture that announces a narrative change, and it makes me wish there were more such shots in the film. Spheeris is one of the many, many directors who got their starts under the wing of Roger Corman, the single most influential figure in American film in the second half of the 20th century, IMO. Martin Scorsese, Francis Ford Coppola, Joe Dante, John Sayles, Jack Nicholson, Jonathan Demme, Ron Howard and many others got their big breaks from Corman. He had a reputation for allowing significant creative freedom so long as the productions came in under his notoriously low budgets. It’s hard to find budget information for Suburbia, but it clearly shares the DIY ethos of much punk music. Most of the actors were nonprofessionals, there are no expensive set pieces, and the action was shot entirely on location — in the very suburbs that the film excoriates as bastions of soullessness. A number of bigger-budget Hollywood films released around the same time as Suburbia — notably Tobe Hooper’s terrific Poltergeist and Robert Redford’s ordinary Ordinary People — cash in on the “soulless suburb” trope. But iI think the somewhat overlooked Suburbia has a place in that canon. *A little digging around has revealed some incomplete but tantalizing evidence that Spheeris, as a 23-year-old film student in 1968, directed one feature-length film before she made The Decline of Western Civilization. Its provocative title is Uncle Tom’s Fairy Tales: The Movie for Homosexuals, and starred Richard Pryor in one of his first film roles. Uncle Tom’s has allegedly been lost … or has it? According to the internet, Pryor’s wife at the time, Shelley Bonis, was unhappy because Pryor was spending more time working on this film than with her, so she took the logical step of destroying its negative. The uncompleted film was apparently regarded as lost to history. But in 2005, shortly before Pryor died, the Director’s Guild of America staged a tribute to the great comedian, at which scenes from Uncle Tom’s Fairy Tales were screened for the first time in decades. Pryor’s then-wife (his seventh), Jennifer Lee, filed suit against Spheeris and Pryor’s daughter, Rain, for having conspired to secure from Pryor’s home the only existing copy of the film. From what I can gather, the suit is still pending. Ethan de Seife was an arts writer at Seven Days from 2013 to 2016. He is the author of Tashlinesque: The Hollywood Comedies of Frank Tashlin, published in 2012 by Wesleyan University Press. When entering the Archives, downtown Burlington's classic-game arcade, one of the first consoles you see is Tapper. The 1983 game, in which a bartender must keep up with his patrons' increasingly frenzied demands for beer, is an apt metaphor for the Archives' two raisons d'être: vintage video games and sudsy brews.